There are never enough road courses on the NASCAR schedule, but if anything, it makes the seldom visits that much more exciting. 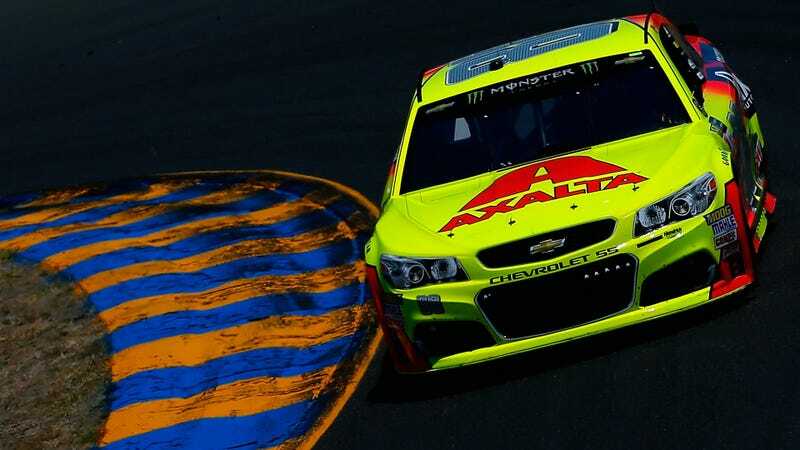 NASCAR’s top series, the Monster Energy NASCAR Cup Series, will be making right turns at Sonoma Raceway for the weekend while the Xfinity Series will be at Iowa Speedway’s oval. The Camping World Truck Series raced there on Friday, and a delayed showing of the race is in the “delayed” column below. There’s also the Pikes Peak International Hill Climb! Our old pal Robb Holland will be there in a salvage Corvette Z06. We’ll have instructions on how to watch this glorious event in another post coming soon. If you’d rather watch some open-wheel cars turn left and right, the Verizon IndyCar Series is at Road America and Formula One is at the Baku City Circuit. IndyCar driver Mikhail Aleshin had some issues getting back into the country for the race, but he got that solved on Friday and was on his way. If you don’t want to see any turns at all, NHRA is at Summit Racing Equipment Motorsports Park in Ohio for the weekend. There’s plenty of two-wheeled stuff over the weekend, too. The MotoGP World Championship is in the Netherlands, while MotoAmerica is at Utah Motorsports Campus—formerly Miller Motorsports Park—and the Lucas Oil Pro Motocross Championship has live coverage from Tennessee. You can catch the Blancpain GT Series Endurance Cup via a free YouTube live stream this weekend, which is wonderful since not many things in life are free these days. Qualifying happened at around 4 a.m. ET Saturday morning, and the main race will roll off at just before noon.